Get ya laptop and headphones ready its time to flip the switch with Isr's first Traktor Remix Decks. This forward thinking set features NI Traktor Remix Decks packed with 80 loops and sounds so you can Mix, Remix, Effect, Mash and explore NI's Traktor like never before. Get ready for the future of Djing as this powerful selection of samples are ready for live application. Load samples into the Decks of this powerful DJ software to create transitions between songs, and ride loops over your favorite tracks for on-the-fly mixing. For our first edition we asked Audio Injection to select Dj friendly loops form across his ISR sample pack collections so you can rock a set with license free loops like nobodies business. Record your sets, upload to Sound Cloud, You Tube and share them any way you want. All the loops are license free while being used in a Dj set and in the studio. To insure that each pack is rock ready we leveled off each sample to match up any track you can toss at them. The files are labeled up nice and neat so when your in a dark room they are easy to find. 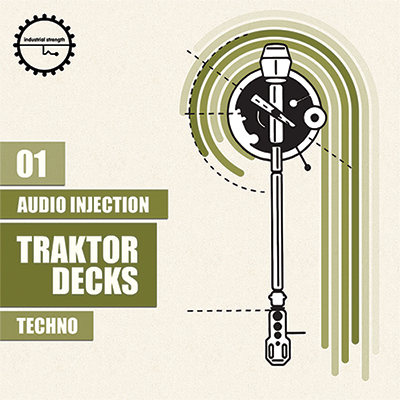 This intense pack is geared up and loaded up with real deal Techno loops to launch into any Techno set but the loops can also work with Minimal, House, Electro and any 4x4 jams you wish to explore. if your Djing, using NI Traktor and just playing what everyone can buy on a music download site. Then maybe its time to take it up a notch and let Audio Injection give you the tools to be herd. All you need is the latest version of Native Instruments Traktor and your off to the club with a fierce sound set of performance tools to keep them screaming for more. © Copyright Industrial Strength Records, All Rights Reserved.